confidence. social skills. trust. new friends. Summer is a great time for students ages 7 to 17 to learn a new skill or grow their technique in a fun, safe and encouraging atmosphere from our team of skilled dance instructors. WHAT AGES? ARE BOYS & GIRLS INVITED? At Lone Star Ballroom we believe EVERYONE IS WELCOME. 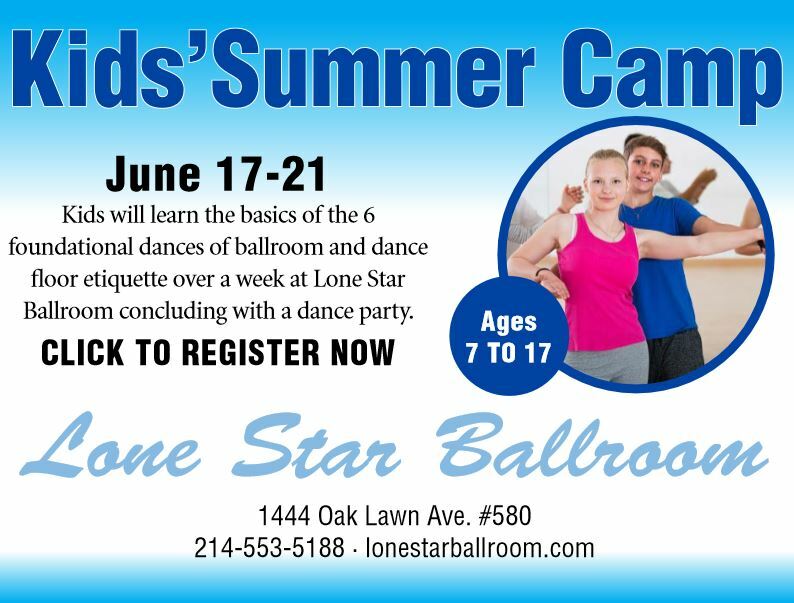 Boys and girls ages 7 all the way to 17 are encouraged to learn to ballroom dance. WHAT DANCES WILL I LEARN? These dances are seen on Dancing with the Stars, Dancing with the Stars Junior, World of Dance and more. These dances are invaluable for Cotillion, Quinceanera, Proms and more! Absolutely – the more the merrier! Feel free to add your friends to your registration. An adult will need to sign the liability waiver before the camp. Jean, shorts, T-Shirts are all perfectly fine. No dance shoes are required., however shoes must stay on your feet (no flip flops). WHAT IF I’M A BEGINNER? Everyone regardless of your level of dance is welcome. We teach in a way where everyone will feel comfortable, whether you have no dance or lots of experience. Is Your Next Best Friend At Camp? Will Dance Help Build My Confidence? and Is It Time To Have FUN!